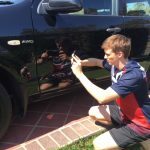 Specialising in paintless dent repair to all personal and commercial fleet vehicles across Brisbane, Gold Coast and the surrounding areas. Whether your personal vehicle got caught out in a storm or your entire fleet of commercial vehicles have been damaged we can have them repaired quickly and professionally. Don’t hesitate, just simply snap a photo of your vehicles dent or hail damage and we will promptly respond with a quote. Dents are removed at a time and a place convenient to you. Most dent repairs can be removed in less than one hour. At PDR 2U we make sure you retain your original factory paint finish so your car will look – just like new! Most dent repairs with PDR 2U will cost a fraction of the price of a panel shop repairer. There are also no call out fees, making your repair job cost effective. Before you go claiming through your insurance for a small dent, most of our jobs cost less than the cost of your excess – why not save your no claim bonus for when you really need it. We offer a lifetime guarantee on all PDR repairs. We are so confident in our service that if your car shows visible signs of repair we will come out and fix it! At PDR 2U we know your vehicle is important to you, for this reason we offer a lifetime warranty on all PDR repairs so you can be sure your vehicle will be repaired first time, everytime!